There was a certain period in time when Zumba had taken over the world and the craze for the dance plus fitness regime had made quite an impact on the public. During this time many companies tried to capitalize on the idea and created all sorts of merchandize to gain the maximum they could from the craze. 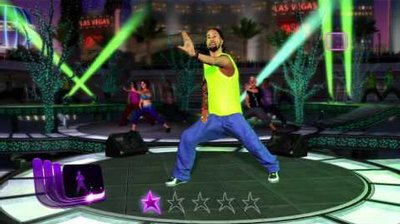 And so there came a game called Zumba Fitness. Developed by Pipeworks Software and published by Majesco Entertainment along with 505 Games, the game is made for the Wii, PlayStation Move and Xbox 360 Kinect platform and allows player to shake a leg to shed that extra calorie and end up with ripped abs at the end. At least that’s what the player would hope for. It brings a great concept of using the movement controls to bust a move and shed some weight. Irresponsive controls and movement controls make most of the effort futile at times. It has different amounts of player support which goes up to eight players to enjoy the game simultaneously. Peppy numbers add to the fun of the game but clunky controls bust up the overall experience of an otherwise great game. Zumba Fitness is nothing revolutionary to look at but it does the job. Its graphics are not all that great, character models are pretty neat as they are mostly represented by a silhouette and not actual dancers. They have a sense of style and cool movement that sets the stage on fire. The environments are ablaze with great lighting which makes the player wanna move and go wild in the middle of their living room. Backgrounds are simple and minimal at their best. The game has a whole lot of peppy and saucy beats that will make anyone want to get up and bust a move. There is a whole variety of music but majority of it is filled with the Latin genre. Nonetheless the soundtrack is great and the voice instructions provided by the three dance instructors is pretty neat. 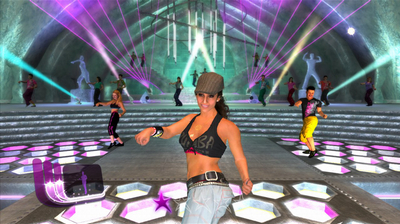 Zumba Fitness’s priority lies in the fact that it is a game that wants you to shake a leg and shed all that weight. Unfortunately it isn’t able to put that point across to the players due to the inaccurate movement controls and their unresponsive nature at times. The player has to really throw himself all over the place for the moves to register. There are three trainers and each trainer takes care of three stages which range from beginner, intermediate to expert levels. There are dancing silhouettes that the player has to follow and accordingly fill a bar to progress towards much harder levels. There are no tutorials as such but the player will find it easy to get the hang of it sooner or later. The multiplayer options make it double the fun to experience at times. Zumbat Fitness does a fairly good job of incorporating the move controls into the dance plus fitness regime and is worth the player’s time and energy.